Moscharaki Giouvetsi is a Greek dish that takes its name from a large earthenware dish called giouvetsi in which it is cooked. Moscharaki is the Greek word for veal and kritharaki is the orzo pasta which looks like rice and comes in three sizes: small, medium or large. I do not have one of these big traditional earthenware dishes but do have some smaller ones. When I was working, I used to cook the meat in a pressure cooker, which takes around half an hour to cook but now I like to cook it in a pot, even if it takes much more time. When the meat is tender, I then transfer it, together with the sauce in smaller earthenware dishes or in a Pyrex, or baking tins (depending on the quantity), add more water and cook the pasta. I am making a very short and easy post just to tell you that I had a nasty cold all this week that’s why I haven’t been around posting or visiting your blogs. I attempted a couple of times to read your posts and leave a message but after reading a couple of posts my eyes were running with tears so I couldn’t continue. Today I am feeling much better and hopefully I shall start reading your posts again. 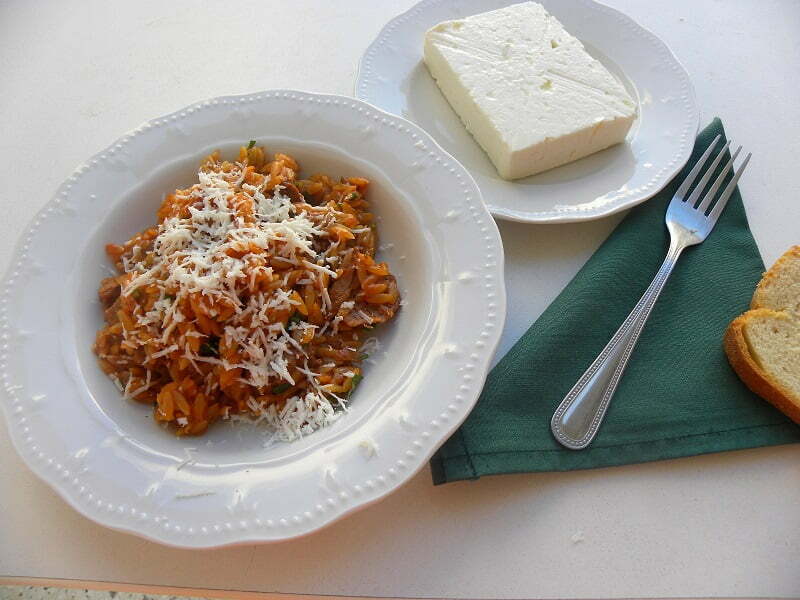 I haven’t been cooking at all this week and thank God my husband knows how to cook a few meals, otherwise we would starve 🙂 However, I want to share with you a recipe I made last week and which represents Greece. I made a twist to the classic recipe of Giouvetsi, I’ve been cooking all these years and a much lighter version as I hardly used any oil, I added garlic which I used to avoid before, fresh tomatoes and red wine. I am submitting this recipe to Presto Pasta Nights, created by Ruth, of Once Upon a Feast. Heat the olive oil in a non-stick sautéing pan and sauté the meat in batches on both sides. Remove to a platter. Add the onion and sauté for a few minutes until translucent and then add the garlic and sauté for a few seconds until fragrant. Put the meat back in the pot and deglaze with the wine. Cook for a couple of minutes until the alcohol evaporates. Add salt, pepper, cinnamon stick, bay leaf, all spice berries, tomato juice, carrot and enough water to cover the meat. Bring to a boil, cover the pot with the lid and simmer for 1 hour and 15 minutes, or until the meat is tender, mixing every now and then. Preheat the oven to 180o C / 350o (or 160o C / 325o F for a convection oven) and transfer the cooked meat with the sauce into a Pyrex or baking tin. Discard the bay leaf, cinnamon and allspice berries and add more than half of the hot water. Add the pasta and cook for about 20 minutes, stirring occasionally and adding the remaining water gradually, until the orzo is cooked. Serve with some grated graviera or myzithra cheese on top. Glad to see you’re feeling better. I LOVE giouvetsi (with any kind of meat) and it’s great to see you made it with a little olive oil and all that wine. Hope you are feeling better. This looks delicious with the veal! Yummy! Hope you are feeling better Ivy. Giouvetsi is definitely a favorite with my family. I love using wine when cooking, and your dish looks delicious. Val, thanks. My husband was spoiling me this past week. Peter, thanks I am feeling much better today. Do you think the wine was too much? Maria, thanks I am feeling better and hope your kids are feeling much better as well. I often use wine when I’m cooking. This giouvetsi sounds delicious. A great addition for the pasta nights. I’m glad to hear you are feeling better. Good to hear you are feeling much better. I have never made anything with orzo, first i thought they were rice, but then as you have submitted the recipe to past night , i knew it is a pasta . I hope you feel better soon, Ivy! This dish looks so good Ivy! That veal must have been so tender and flavourful… mmmmm. Today I had lunch too early and now I’m starving, the sight of that dish makes my stomach roar!!! Hi Ivy! Thanks so much for visiting my blog! I really enjoying crusing through your blog. I love Greek food so I will definitely be back! I am so glad you are feeling better! 🙂 I will definitely try this recipe with beef. Thanks for the tip about blogger back up Ivy, I will update it (link you) in the post. It is useful information for the readers. Perastika Ivy and get an avgolemeno soup to help you get well. Giouvesti is quick, satisfying and I like your addition of kanella. Hope u get well soon! Havent tried orzo yet..Looks simple n delicious..
Mmm, one of my most favorite foods ever! Althoug I admit, I have never had it with veal – only beef, lamb & chicken. Definitely will give the veal a try! I learned something today. Never knew until now that orzo is a pasta. I’ve had it before but I’ve always assumed it’s a grain, in the same family as rice. Hahahahaha! What I am doing food blogging when I didn’t even know that? Delicious post! Truely comforting and delicious! I love orzo! Oh, gosh, hope you’re feeling better. This looks really great. This looks great Ivy. I have made this dish once from Peter M’s recipe, and really liked it. Ahh! I commented on the wrong post! Anyway, I hope you feel better. Colds are the worst. I don’t blame you for not reading blogs. GET BETTER! Hi Ivy, my new Facebook friend. This giouvetsi sounds delicious! I’ve never tried veal before but it sounds delicious!